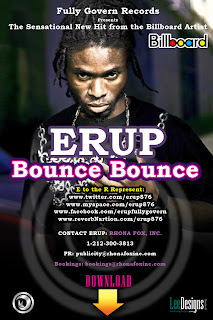 iDancehallReggae.com::Caribbean Lifestyle Media::: BUZZ: Erup Release "Bounce Bounce"
BUZZ: Erup Release "Bounce Bounce"
Dancehall artiste Erup is back on the scene with a new tune call "bounce bounce". Those familiar with Erup's "click mi finger" may have been eagerly waiting for another hit from Erup. Erup is a part Fully Govern Records and has connected with PR firm Rhona Fox, Inc to move his career in the right direction. Erup can be booked by emailing booking@rhonafoxinc.com and follow Erup twitter.